An interactive story for the preschool age about birthdays, cakes and friendly monsters. The white cuddly toy of Marc is lost. No one can find it. "When I got up, it was still there", grumbled Marc. So everyone is glad when the Pattapouf reappears out of the washing machine. Except Marc! "A purple cuddly toy? Out of the washing machine? As cute and soft as my Pattapouf? Unbelievable!" 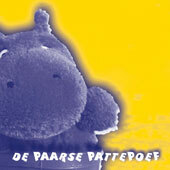 The purple Pattapouf is an interactive story for the preschool age. Birthdays, pelting rain, friendly monsters, cakes, mothers, boots and soul-searching questions keep both the children and the storyteller breathless behind. All suggestions from the children are useful: "We have a dog at home! ", "My cuddly toy is yellow! ", "I don't like strawberries! ", "My father has a fishing rod!" 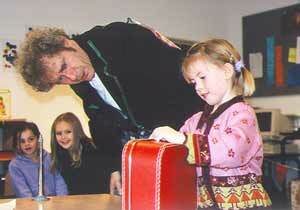 The performance is suitable to an audience from 3 up to 7 years old. It can be performed at schools and libraries. The performance will last about 40 minutes.